It’s time to think spring and get busy planning and planting for months of colorful spring beauty. Create a continuous parade of color with early, mid and late spring bloomers. You’ll enjoy the burst of color and sustained beauty spring flowering bulbs provide. Start the spring with some small scale, minor, bulbs like crocus, winter aconite, snowdrops and glory-of-the-snow. Add some early tulips and daffodils and the unique nodding bell shaped flowers of checkered lily. 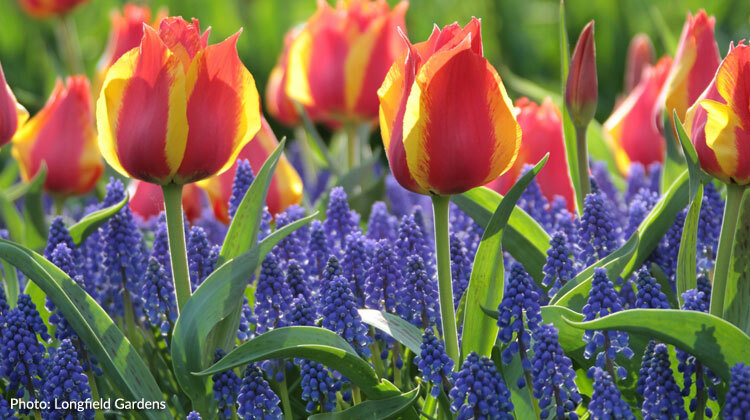 Include some cheery mid-season daffodils and colorful tulips mixed with lower growing grape hyacinths and ground hugging Grecian windflowers. You’ll appreciate a double layer of color and beauty. Continue the tulip and daffodil display with late spring flowering varieties. But don’t stop there. Add some bold beauty with alliums that provide a colorful bridge between spring bulbs and early summer perennials. A bit more information: Brighten the shade with the sky blue, white and pink Spanish bluebells also known as wood hyacinths. Their dangling clusters of bell shaped flowers adorn 12 to 15” tall plants. And include the delicate beauty of the world’s most popular cut flower, the Dutch iris. Buy the bulbs in bulk to save money and insure you have plenty of blooms for your arrangements.